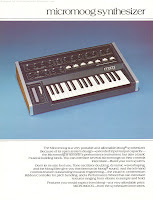 Moog Liberation keytar / synthesizer reference sheet from 1980. What do we have here? 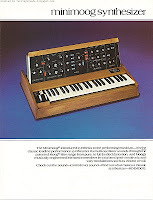 It's another member of the Moog 1980 reference sheet family! And nope - it's still not the last one. There's even more in the series. 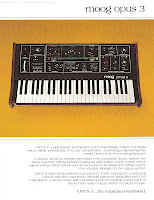 The others in the series that I have already posted include those scans below for the Polymoog, Opus 3, Minimoog, Micromoog, Prodigy and Multimoog. Click on the images to go to their respective blog posts! These should really be re-printed as collector cards. Just sayin'. 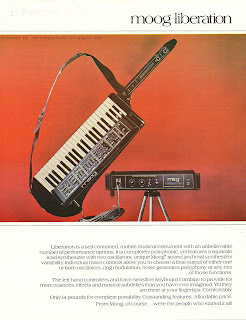 Not sure why it took me so long to post the Liberation sheet - I'm a bit of a keytar freak. If I had been born in the 18th century, I probably would have been hangin' around with Beethoven and had an Orphica strapped around my neck. 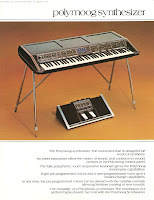 But as much as I would have wanted to have had my own Liberation to riff with, it's never happened. 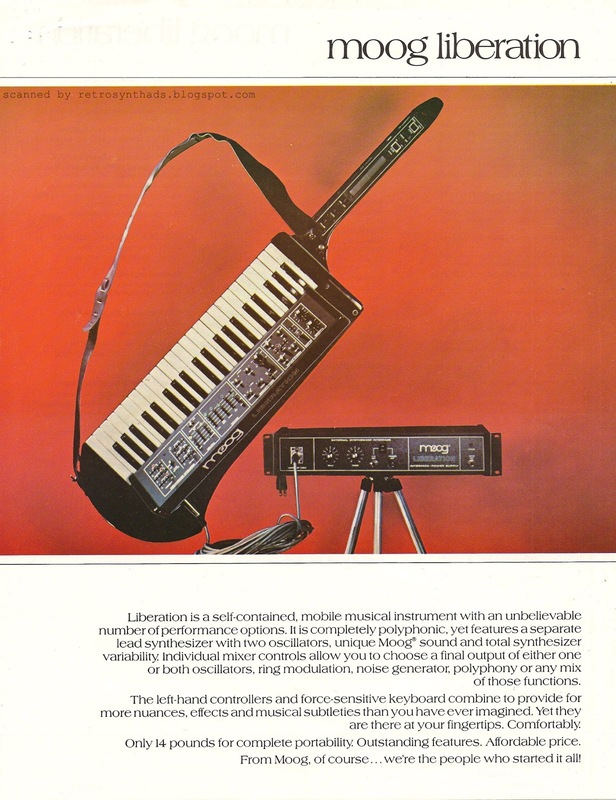 The closest I've come is having a Poly-800 or a CZ-101 strung over my shoulder - and technically they're not even keytars because they don't have necks. Hrumph. I love everything about that front photo. The way the Liberation seems to just be floating there (including the shoulder strap!) and the subtle shadows on that warm red background. So gorgeous. 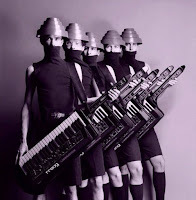 But if there is one photo of the Moog Liberation I love more than the one in that reference sheet, its this classic photo of Devo holding FIVE Liberations (photo taken from Club Devo - go visit and become a member!). 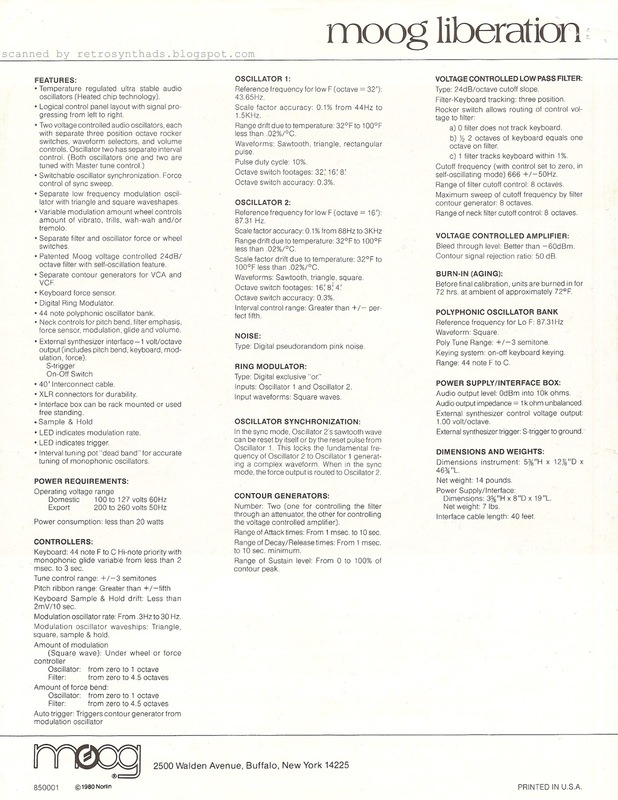 Back to the reference sheet - after admiring that lovely photo, its just natural to flip the page over to read about all those yummy specs. And everything you need to know is there. Including the date of printing of the sheet itself! But for me, the most curious of the specs is that "Burn in (aging)" section. 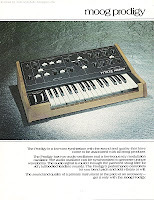 "Before final calibration, units are burned in for 72 hours at ambient of 72 F"
Similar info also appears on the back of the Prodigy reference sheet and I commented briefly about it in that blog post too. 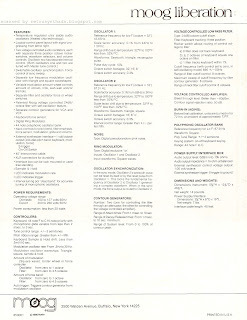 Interestingly, I'm pretty sure that info isn't referenced in the other sheets in this series. Just those two. 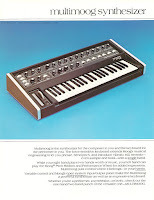 Which kinda makes a sense since according to Wikipedia, the Liberation is most closely related to the Prodigy. But I wonder why they note that burn-in time for those two specifically. Anyways, that's it for now. Time to go down that Devo video rabbit hole!